In support of the Committee's longer-run planning for improvements in the implementation of monetary policy, the Desk report also included a briefing on the potential for establishing a fixed-rate, full-allotment overnight reverse repurchase agreement facility as an additional tool for managing money market interest rates. The presentation suggested that such a facility would allow the Committee to offer an overnight, risk-free instrument directly to a relatively wide range of market participants, perhaps complementing the payment of interest on excess reserves held by banks and thereby improving the Committee's ability to keep short-term market rates at levels that it deems appropriate to achieve its macroeconomic objectives. The staff also identified several key issues that would require consideration in the design of such a facility, including the choice of the appropriate facility interest rate and possible additions to the range of eligible counterparties. In general, meeting participants indicated that they thought such a facility could prove helpful; they asked the staff to undertake further work to examine how it might operate and how it might affect short-term funding markets. A number of them emphasized that their interest in having the staff conduct additional research reflected an ongoing effort to improve the technical execution of policy and did not signal any change in the Committee's views about policy going forward. So, what does that mean? If you check the state of the Fed's balance sheet, you'll see that the current size of the Fed's balance sheet is about $3.6 trillion. On the liabilities side, the Fed has reserve balances outstanding of about $2.2 trillion, and the Fed's assets include about $1.3 trillion in mortgage-backed securities and about $2 trillion in long-maturity Treasury notes and bonds. The Fed currently holds no Treasury bills. Thus, relative to pre-financial crisis times, the Fed has issued a very large stock of reserves in order to expand its asset portfolio. Further, that portfolio, which used to have a composition that looked roughly like the composition of the federal government debt outstanding, now is tilted heavily toward the long-maturity end of the spectrum, and includes assets which, though passed through public hands, are essentially private. For a very long time, the Fed is likely to have a balance sheet that is very large relative to what it has been historically, and it is not likely to be selling off assets or if it does sell assets, to sell them at a high rate. Thus, the Fed is likely to be operating under a "floor system" for a long time. Under a floor system, there are excess reserves outstanding in financial markets each night, and the interest rate on reserves plays a key role in determining short-term interest rates. But, given the complications of the law governing payment of interest on reserves, GSEs (Fannie Mae and Freddie Mac) hold reserve accounts but cannot be paid interest on reserve balances by the Fed. Indeed, it seems that most of the current activity on the fed funds market consists of GSEs lending reserves overnight to financial institutions that receive interest on reserve balances. Arbitrage would seem to dictate that fed funds would trade at 0.25%, the interest rate on reserves (IROR), but that's not what happens, as you can see in the chart. There is something inhibiting arbitrage - the GSEs are poor bargainers, fed funds borrowing has implications for deposit insurance premia, for example. And it's not like the friction in the market is going away. Currently the margin between the IROR and the fed funds rate is about as large as at any time since the Fed started paying interest on reserves. So, what happens when the Fed reaches the "liftoff point," when it decides that the IROR should go up? Possibly the margin between the IROR and the fed funds rate stays at about 5 to 15 basis points. Maybe that margin increases. We might make some predictions based on what we think is determining the spread, but those predictions could be wrong, which could be embarrassing for the people running the Fed. For most of the financial system, the relevant opportunity cost of overnight funds is the IROR, not the fed funds rate. 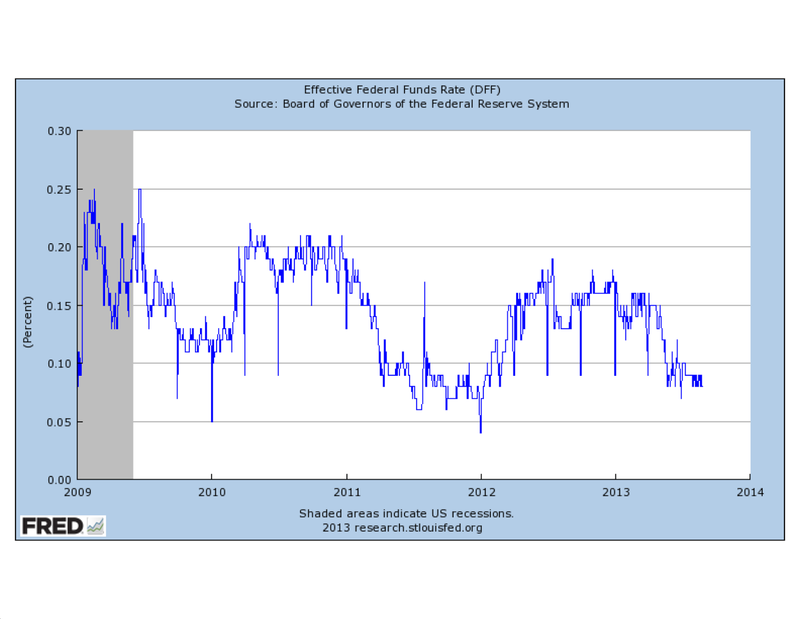 But, the Fed sticks to the fiction that the policy rate it cares about is the fed funds rate. The key wrinkle is that, officially, the IROR is set by the Board of Governors, not by the FOMC. Suppose that the Fed, two years from now, announces that it intends to tighten. Suppose further that this tightening takes the form of an increase from 0.25% to 0.50% in the IROR. But what does the FOMC tell us about its target is for the fed funds rate in these circumstances? Currently the IROR is 0.25%, and the FOMC claims the "target" for the fed funds rate is 0-0.25%, which is obviously pretty safe, as 0 and 0.25% bound the possible outcomes. When tightening happens, suppose that the FOMC says its fed funds target is 0.25%-0.50%. Obviously that doesn't look like pre-financial crisis policy - it's not "normal" for the FOMC to be giving a range for the fed funds target. How does the Fed explain that? Alternatively, suppose the FOMC says the fed funds target is 0.30%, but it can't get the fed funds rate to go that high? What then? And what happens at higher levels for the IROR? Given the importance people attach to the policy rate, how is the Fed going to explain itself? When the Fed first broached the idea of using reverse repurchase agreements (reverse repos) and term deposits, they sold the idea as "introducing reserve-draining tools." Initially, I thought this either represented a misconception about what causes inflation on the part of the Fed. Maybe they didn't understand that this change in the composition of the Fed's liabilities through the use of these tools would have little or no effect on inflation. Or maybe the idea was to reassure people who thought that reserves are money waiting to bust loose and cause a hyperinflation - if you give the reserves another name maybe those people won't be so bothered. Now I'm thinking this might be the brightest idea the Fed has come up with in a long time - at least the reverse repo part. What's a reverse repo, in this instance? The New York Fed has experimented with small volumes of these transactions, in order to get some practice. As the excerpt above, from the FOMC minutes, indicates, the Fed reverse repo intervention will proceed as follows. The Fed will set a rate at which it will borrow in the overnight repo market, using the government bonds and mortgage-backed securities in its portfolio as collateral. The effect of such a reverse repo transaction is to change the composition of the Fed's liabilities - reserves outstanding are reduced, replaced by a collateralized loan to the Fed from the private sector. You might ask why a loan to the Fed needs to be collateralized. Surely the Fed is going to be good for it. But the Fed already has unsecured liabilties - those are called reserve accounts. But what could this possibly accomplish? First, take a look at the newly-expanded list of reverse-repo counterparties, from the New York Fed's web site. This list includes the GSEs - Fannie Mae and Freddie Mac. Thus, reverse repos are a roundabout way of paying interest on reserves held by the GSEs, while staying within the bounds of the law. Further, the repo market potentially has a wider list of participants than the fed funds market does, and the fact that the lending is secured (fed funds lending is unsecured) makes the overnight repo rate a potentially better policy rate from the Fed's point of view. It's possible then, that engaging in reverse repos allows the Fed to tighten up its control over short-term interest rates, while giving the public a better read on the effects of Fed's policies, and on Fed intentions. But, presumably what will happen post-liftoff is that the balances in GSE reserve accounts will disappear overnight into reverse repos with the Fed. There will then essentially be no activity on the fed funds market, and the fed funds rate will become meaningless. Maybe the fed has plans to supply data on overnight repo rates. Maybe such data exist (if so, please let me know). Of course, if the Fed reverse repos enough of its portfolio, it can reduce reserves to pre-crisis levels, which would presumably produce an active fed funds market. Maybe that's what the Fed wants. I know next to nothing about the practicalities of financial market trading, but wouldn't rolling over more than $2 trillion in reverse repos every day be a costly endeavor? In any case, I think there is more to the reverse repo idea than might meet the eye. I think the Fed should tell us more about it. It is interesting to compare this with the ECB's operational framework, which has included Reverse Repos for quite a while. See especially Box 1 in page 15 of that paper. "but wouldn't rolling over more than $2 trillion in reverse repos every day be a costly endeavor?" I was thinking the same all along! It's not out of the question that this will happen though. Part of it's a governance issue for the FOMC. The Board sets the interest rate on reserves, but the FOMC wants to set policy, and this is a way to accomplish that. Do you think that providing financial support to the GSEs is also a motive? Great series of observations here, Stephen. I'll post a smattering of comments. "Maybe such data exist (if so, please let me know). " There are complications here. There isn't a universal repo rate -- different collateral can be repoed at different rates. What specific repo market will the Fed target? Agency repo might trade at a higher rate than Federal, and MBS higher than both. Different tenors within the same class may have different repo rates. I sometimes look at the DTCC Treasury General Financial Collateral (GCF) repo rate. It tracks general collateral. GC is the "range of assets that are accepted, at any particular moment, as collateral in the repo market by the majority of market intermediaries and at a very similar repo rate." Non-GC collateral may be subject to unusual demand and trade at significant discount to GC collateral. See here, for instance. The Fed will have to iron the difference between specific repo and GC repo. Interestingly, the Bank of Canada targets the overnight repo rate called CORRA, not the unsecured rate. The Canadian overnight repo rate (CORRA) is the weighted average rate of overnight general (non-specific) collateral repo trades. So will the Fed just to what the BoC does? What it seems the Fed wants to do is to fix a rate, and then let the market take whatever it wants at that rate. Then, I guess there's no issue of what the "market" rate is. The rate the Fed is interested in is the one it quotes. "But the Fed already has unsecured liabilities - those are called reserve accounts." All reserve accounts are collateralized. If reserves are created via discount window lending, appropriate collateral must be submitted by the borrower. If reserves are created by OMOs, the nature of a repo means that the Fed takes in an asset in return for a short term extension of reserve deposits. You're right that the fed funds rate is unsecured -- but the Fed doesn't actually participate in the fed funds market. It only influences it obliquely via repos. Yes, a discount window loan to a private financial institution is secured with collateral posted by the financial institution. What I meant was that reserves are a liability of the Fed, but those reserves are not secured by collataral posted by the Fed, as reverse repos would be. "But, presumably what will happen post-liftoff is that the balances in GSE reserve accounts will disappear overnight into reverse repos with the Fed. There will then essentially be no activity on the fed funds market, and the fed funds rate will become meaningless." Here's a mystery for you. I'm pretty sure that GSE's could always participate in the repo market. Whihc means they never had to wait for the Fed to introduce a special reverse repo program. Why didn't the GSEs retreat from the fed funds market and into the repo market a few years ago? In general, repo has been higher yielding than fed funds. The fed funds market should've disappeared a while ago, the fed funds rate becoming entirely meaningless. That's in part why I wanted to look at the time series of repo rates. Your claim is that the GSEs could get a better deal in the repo market than on the fed funds market, but the rates I quoted above, e.g. .03, .04, are less than the current fed funds rate. Another interesting fact that I learned today is that the GSEs were a very large player in the fed funds market even before the financial crisis - supposedly as much as 50% of the market. Puzzling as well, if what you say is true. Maybe trading on the fed funds market unsecured is really low cost, if you trade with large institutions that are too big to fail. I've downloaded the data from DTCC in Excel format for free from 2005 up to this August. Should still be available. Or go to my blog and reference this very handy chart that shows interest rate spreads. In general, the DTCC Treasury GCF repo rate has been above the fed funds rate and below IOR since 2010. Thanks for putting the data up. That's interesting. Here's what I think is going to happen. There is a governance issue. The FOMC wants to control overnight interest rates, and doesn't want the Board of Governors doing that by setting the interest rate on reserves. So, the Fed will experiment with large reverse repo transactions after the liftoff date until they get into a situation where the Fed operates in a channel system. The interest rate on reserves will be the lower bound, the Fed will set a repo rate above the interest rate on reserves, and reverse repo a very large quantity of securities in its portfolio at that fixed rate at the end of every day. That fixed rate will be the announced "target." Then, private repo contracts can be whatever they are. Presumably there are various risks and transactions costs that explain the interest rate margins that we're seeing in your charts. The governance issue you bring up is very interesting and I can see why it might be guiding the decision to choose either IOR or repo as the policy instrument. "The interest rate on reserves will be the lower bound, the Fed will set a repo rate above the interest rate on reserves, and reverse repo a very large quantity of securities in its portfolio at that fixed rate at the end of every day. That fixed rate will be the announced "target." Then, private repo contracts can be whatever they are." Ok, but if the Fed were to start now it would be conducting a certain amount of reverse repos at 0.3% whereas the market rate is today's 0.04%. Doesn't that amount to a subsidy from the Fed to banks? What happens if it doesn't have enough securities to satisfy demand at the fixed rate? Does it lose control over the repo rate? This may be a paper worth reading. "Doesn't that amount to a subsidy from the Fed to banks? What happens if it doesn't have enough securities to satisfy demand at the fixed rate? Does it lose control over the repo rate?" Subsidy? I don't think you want to think of this specifically as a subsidy. By virtue of how fed intervention works, any intervention will somehow harm or help banks. I don't think it's important in this case. Losing control? The Fed will obviously need some practice. Presumably they can figure out how to set the rate appropriately. But I guess there is always a risk that something unexpected happens, and they can't satisfy the demand at the rate they fix. Maybe they have to put a limit on the quantity. I'm curious now how the ECB system works. "There is something inhibiting arbitrage - the GSEs are poor bargainers, fed funds borrowing has implications for deposit insurance premia, for example." I've heard these reasons before. It's odd that the fed funds rate trades at a varying discount to IOR rather than a constant discount. Insurance premia don't fluctuate, do they? Are GSEs sometimes good at bargaining and sometimes bad? Could there be something else behind the discount? Exactly. There's nothing obvious about what explains the margin. Please if someone could elucidate me on this: currently financial institutions are getting interest on their reserves of 0,25% and financing through the fed funds market at 0,15%, right? The problem is that therefore they have less of an incentive to lend, and this situation will grow into something weird and bad when things get normal, if nothing is done. Is that it? Also, what could be the costs of "rolling over more than $2 trillion in reverse repos every day"? Thank you in advance. Oh, and apart from incentives, it also removes the Fed's hability to control and set short-term rates, because in practice they are not 0,25% but 0,15%, right? Most financial institutions are holding large quantities of reserves, for which they earn 0.25% if they hold them overnight. But the "government-sponsored enterprises," FNMA (fannie mae) and FHLMC (freddie mac), also hold reserve accounts (very big ones) and by law cannot receive interest on reserves. So they lend those reserves overnight to institutions who do get interest on the reserves. That's 99% of fed funds activity now. The big question is why banks are willing to hold $2.2 trillion in reserves at 0.25%. It seems there should be better opportunities out there than that. But that's obviously not the way that banks see it. Now presumably, once lending opportunities are better, then 0.25% will start to look less attractive. Either the Fed will have to increase short-term market interest rates or we will have more inflation, as banks try to get rid of their reserves. This issue about reverse repos just relates to how the Fed will control market interest rates - through the interest rate on reserves or through the repo market. Thank you! It is more a matter of "how" rather than "what" then.. I see! You wrote: "...and the fact that the lending is secured (fed funds lending is unsecured) makes the overnight repo rate a potentially better policy rate from the Fed's point of view." Why? The Fed could set the RP rate at 0.2%, which would keep the banks away but attract the GSEs. Now the Fed funds rate should stay around 0.2%. I don't get the mystery. If there are better opportunities out there, banks won't be attracted by the overnight repo rate. What happens when, out of the blue, the FED needs to tighten? It will tighten and raise rates with all its instruments. I can't imagine the FED can't do that. And, as far as you can say, you don't know either why. The real problem is if there is stagflation, that is, if one instrument (monetary management) has to achieve two objectives at the same time. But it is unrealistic to imagine that we will experience a recession with higher inflation IN THIS CRISIS. We are in a totally different situation even if it seems hard to accept by people in the monetarist camp. They think that it's 1978 all over again. Well, it's not. A likely out-of-the-crisis scenario is: the economy start to expand catching up with long-run potential output. It will take at least 5 years. In the meanwhile, the FED can slowly adjust its balance sheet operations. If, in 5 years, expansions runs wild, the FED will have to tighten (hope Greenspan won't be named by the next Republican President) and the FED will have the usual instruments to achieve price stabilization. Look at macro data. Even admitting that average long-term potential growth have been reduced by the crisis, it takes GDP growth over 5% for at least 10 years before we got to the point where the Phillips curve with adaptive expectations start to make inflationary pressures run wild. With rational expectations it can take a shorter period of time. But why should it be rational to expect over 5% GDP growth for 10 years? By the way, credibility of those who had predicted hyper-inflation is very low. While the FED has shown to be able to manage monetary policy for monetary goals quite good indeed. Let me add that, if you find someone willing to bet 10.000 dollars on Fed's inability to manage inflationary pressures in a scenario that has actually only a 1% probability, please give him/her my mail address. Forward Guidance in the U.K.